Nationally up to 60 % of persons living with HIV are neither taking antiretroviral therapy (ART) nor well engaged in HIV care, mainly racial/ethnic minorities. 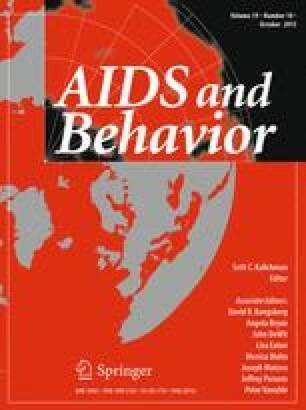 This study examined a new culturally targeted multi-component intervention to address emotional, attitudinal, and social/structural barriers to ART initiation and HIV care. Participants (N = 95) were African American/Black and Latino adults with CD4 < 500 cells/mm3 not taking ART, randomized 1:1 to intervention or control arms, the latter receiving treatment as usual. Primary endpoints were adherence, evaluated via ART concentrations in hair samples, and HIV viral load suppression. The intervention was feasible and acceptable. Eight months post-baseline, intervention participants tended to be more likely to evidence “good” (that is, 7 days/week) adherence (60 vs. 26.7 %; p = 0.087; OR = 3.95), and had lower viral load levels than controls (t(22) = 2.29, p = 0.032; OR = 5.20), both large effect sizes. This highly promising intervention merits further study. We wish to thank the men and women who participated in the study, the Peter Krueger Center for Immunological Disorders at Mount Sinai Beth Israel, Spencer Cox Center for Health at Mount Sinai St. Luke’s-Roosevelt Hospital Center, and Gay Men’s Health Crisis for making this study possible. Special thanks to Rob Shiau at the Peter Krueger Center and Zach Hennessey, MA at Spencer Cox for facilitating study implementation. This work would not have been possible without Lisa Sanfilippo, RN; Andrea Wagner, RN; Christopher Hilliard, MPH; Amy Braksmajer, Ph.D.; and Victoria Sharp, MD. The study was supported by the National Institutes of Mental Health (R34MH093352) and the Center for Drug Use and HIV Research (CDUHR; P30 DA011041). Dr. Monica Gandhi was supported by NIAID/NIH RO1AI098472 and we thank Drs. Yong Huang and Howard Horng, directors of the hair analysis laboratory at UCSF. We particularly wish to acknowledge our Program Officer at the National Institute of Mental Health (NIMH), Michael Stirratt, Ph.D., Program Chief at the NIMH Division of AIDS Research for scientific guidance throughout the study. Center for Disease Control and Prevention. HIV in the United States: the stages of care. November 2014 Available at: http://www.cdc.gov/nchhstp/newsroom/docs/HIV-Stages-of-Care-Factsheet-508.pdf. Accessed 1 Dec 2014. National Institute on Drug Abuse. Seek, test, treat and retain for vulnerable populations: data harmonization measure (demographics measure). Available at: http://www.drugabuse.gov/sites/default/files/sttrfiles/DemographicsV.pdf. Accessed 3 Feb 2015. Huba GJ, Melchior LA, Staff of the Measurement Group, HRSA/HAB’s SPNS Cooperative Agreement Steering Committee. Module 26B:CES-D8 Form. Culver City: The Measurement Group, 1995. Available at: www.TheMeasurementGroup.com. Huba GJ, Melchior LA, Staff of the Measurement Group, HRSA/HAB’s SPNS Cooperative Agreement Steering Committee. Module 11: Client Satisfaction Survey. Culver City: The Measurement Group, 1997. Available at: www.TheMeasurementGroup.com. Department of Health and Human Services. Clinical Care Guidelines. Available at: http://aidsinfo.nih.gov/guidelines. Accessed 21 Sept 2014. Department of Health and Human Services. Guidelines for the use of antiretroviral agents in HIV-infected adolescents and adults. May 2014. Available at: http://aidsinfo.nih.gov/contentfiles/adultandadolescentgl.pdf. Accessed 25 Sept 2014. New York City Department of Health and Mental Hygiene. Antiretroviral Therapy. Available at: http://www.nyc.gov/html/doh/html/living/nyc-hivart.shtml. Accessed 1 Oct 2014. Centers for Disease Control and Prevention. HIV in the United States: At A Glance. Available at: http://www.cdc.gov/hiv/statistics/basics/ataglance.html. Accessed 10 Oct 2014.